Musicality – we wish you every success! Stamford School pupil James Ellis, a teenager from the Bythams, is demonstrating his extraordinary enterprise and promotional skill by organising Musicality, a major concert at Peterborough Arena on Friday 4th November in support of four very deserving charities. He has aimed high and secured several major acts: Toploader, B.o.B, Scouting for Girls, and Jay Sean will headline, with a live DJ set from host Vernon Kay. The four charities to benefit are #teamgeorge, Anna’s Hope, the Injured Jockey’s Fund and The Matt Hampson Foundation. ”Last summer, when on Rugby tour to South Africa, an accident happened. On one sunny afternoon, many lives can be turned upside down simply by one incident. This made me realise just how precious every life really is and how quickly things can change. With this, I grew the passion to make change for those unfortunate people that we see every day. Not only to financially support the charities, but to show them that in modern society, they have the support of thousands of people. The 4 causes that we have chosen to benefit from this concert are simply incredible. Between them they have supported and inspired hundreds of individuals and their families. I first gained exposure to them when I was at primary school and have a connection to each one; having seen first-hand how public support can change peoples’ lives. I wanted to create this event at Peterborough Arena. I had a dream and this dream is coming true. To bring to you a concert, as a show of reward, for all the hard work that has been given by these charities over the years. 100% of all proceeds will be split between the beneficiaries with no profit taken by our organisation. Let’s bring thousands of people together at 1 place and at 1 time, to show our support. You will not forget this night, I promise. Bythams Music wish James every success and urge everyone to spread the word and support him. What a fantastic week-end of music, fun, laughter, games, beer, food, good company and a great community feeling! So, many thanks to everyone who has helped make this year’s festival the best we have held at CB. It has taken a lot of planning, weaving in some new ideas and taking some risks that we first discussed way back last summer in the Castle Inn garden. It all came together really well in the end and gives me great confidence that we can do things so well with such great support from a whole lot of folk. I know that the weather helped – if it had been like this morning on any of the days of setting up or the festival itself, it would have been really difficult to have continued I think, but hey ho, our luck held. We will have a debrief meeting soon – date to be agreed – and we will also have a post-festival bash later in the summer where all our volunteer helpers can join us. Again a date has not been fixed, but most likely in August. Once again, my warmest thanks to everyone who has played their part in making this year’s festival so good! 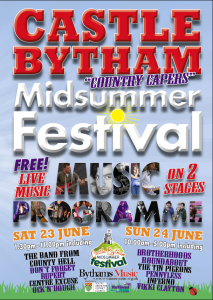 We have a very exciting late addition to our music programme for Castle Bytham Midsummer Festival this Sunday. We are delighted to be able to welcome IMPULSE, an International Outreach Training programme for 16–18 year olds at The Purcell School, Britain’s oldest specialist music school. The Lincolnshire Team, led by Sam, the runner-up in Young Drummer of the Year, include dazzling classical musicians who have performed in London venues such as the Royal Albert Hall (BBC Proms), Royal Festival Hall and Wigmore Hall, and the fabulous rising stars ‘The Delegates’, a Jazz/Funk/Soul band whose lead singer Alice is an International Jazz Festival participant.